“....Good to work with this contractor and crew. I'm pleased!" 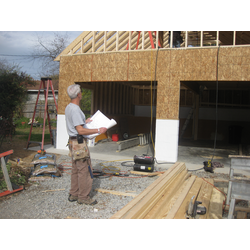 Duke Construction, Inc is a small full service general contractor capable of managing projects and performing many of the subcontractor services involved in the overall job. We will do the entire project or any part of it such as excavation and grading, footings, foundations, flat concrete, framing, roofing, siding, interior trim, hardwood flooring, ceramic tile, hardscapes, and metal handrails. We also do repair work such as storm damage, termite damage, porches and stoops that are sinking, wet crawl spaces and basements, etc. We’ll even build you a bridge over a stream or low area of your driveway. If you don’t see it listed, just ask, chances are we’ll be able to help you with your project. The business began in 1983 as a part time sole proprietorship specializing in decks, fences, concrete walks and patios, and small repairs. As experience was gained, larger more complicated projects were undertaken. Helpers and experienced carpenters were hired, crews were formed and tools and larger equipment was purchased in order to give the company greater flexibility and more opportunities. Storage buildings, additions, screened porches, and garages were added to our product lines. We built our first custom home in 1991. Speculative home building began in the late 1990’s. Because of our ability to do so many different types of projects, we have been able to weather the extremely cyclical nature of the construction business and remain fiscally capable. Attention to the details of the construction process as well as following sound business operating practices have been our recipe for success for over 30 years. We believe in a “hands on” approach to the building business. The owner, Fred Laube, has experience in many of the trade disciplines such as excavation; concrete, brick, and stone masonry; rough and finish carpentry; and welding and iron work. We’re in this business because we chose it and we like it. - Initial contact when the project is discussed and a general estimate is developed. - Site visit is made to determine its impact on the project (terrain, ability to accept deliveries, architecture of main buildings, situation of the project on the lot). - The contact which contains the specifications and payment requirements is drawn up and signed (deposit is made at this time). - Plans are drawn and submitted for approval by customer. - Construction phase is run to completion.